God has washed away my sins! I was looking at a photo that I had taken of the Grand Canyon when I began to wonder about what happened to all that dirt that once filled it up. It’s just gone, never to be seen again. Christ took advantage of that thought and created in my mind a analogy between the missing dirt that’s never to be seen again and my sins. He reminded me that He had separated me from my sins as far as the east is from the west. 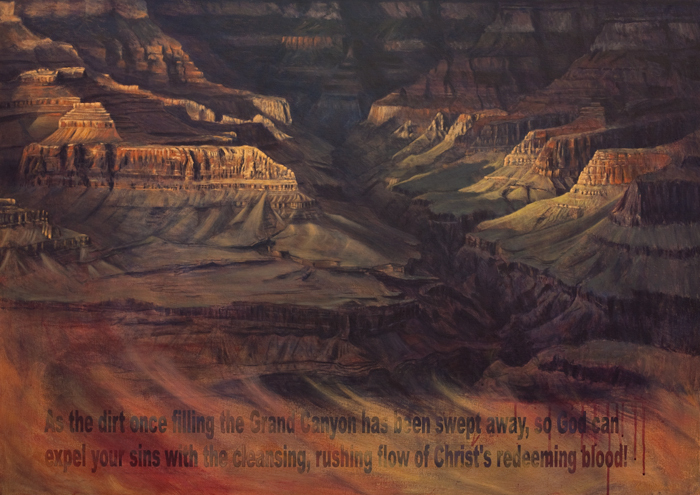 As the dirt that once filled the Grand Canyon is just gone, so are my sins. So I painted this painting to remember it by. Yes, I have been cleansed by the blood of Jesus and I am forgiven. Wow! If you are in Christ the same goes for you. If you are not in Christ then your sins are still clinging to you like sand on sandpaper. Only Christ can forgive you and cleanse you of all your sins. Only Christ. He has to cleanse you of your sins before He can indwell you. He will do that the moment you ask Him to. What are you waiting on? Now is the time.